Laura Higgins MD, an avid backpacker since the early 1980's, discovered llamas in 1997 and has not carried a backpack since! She owned and operated English Mountain Llama Treks in the Blue Ridge and Smoky Mountains of western North Carolina from 2002 until she and husband, David Bray, relocated to Colorado in 2009. Many of the llamas in their pack string were born and trained on Laura's farm in Tennessee. Laura is active in numerous regional and national llama organizations, having served on the board of Pack Llama Trial Association for many years. Her passion is exploring the great outdoors and sharing her knowledge of wildflowers and nature photography with others. When Laura isn't packing with llamas she works as a general surgeon for the Indian Health Service. David Bray was first introduced to llamas in 2007 when he met Laura. He also has a keen interest in hiking and is a marathon runner. He has guided llama pack trips with Laura since 2008. Judy Osborne, RN acquired her first couple of llamas as rescues from a local stockyard. She now manages a small herd of 5 llamas. She has been hiking in and around the San Juan Mountains for the past 5 years. Her "real job" is as a nurse in the Day Surgery Unit of Northern Navajo Medical Center. Mr. Peanut, now age twenty, is the first llama Laura owned and personally trained to pack. Over the years, we have developed a very special relationship built on trust. He finds a niche just about anywhere in the pack string. He has been a fantastic role model for Levi, until recently our youngest member of the string. Levi is quite relaxed—nothing seems to excite him. He leads well and does not “complain” about his work load. He has been packing full-time since 2011. Obsidian (Sid for short) is a seasoned packer who worked for the forest service trail maintenance team for several years before joining our pack string. He is our most athletic llama and works like a well-oiled machine. Kid Calico is rather shy, but enjoys having ladies lead him. He softly hums along the way. His hum gets louder near the end of the day when he is ready to go back to the farm. His father, White Lightening, was a grand champion in the Performance and Packing Classes in the show ring. Kid is now retired but occasionally joins the pack string on day treks. Hiyo Silver is often requested because of his name alone. He is very laid-back and handles easily. Truffles Teddy Bear (Teddy for short) was also sired by our stud, Cimmaron, and trained on our farm. He is all business. He is perhaps the most handsome of our males and has proved himself in the show ring with several blue ribbons, demonstrating the versatility of these magnificent animals. Unfortunately, due to an old injury and arthritis he has been retired. Blue is a blue-eyed seasoned packer who has joined our pack string from Wyoming where he packed the Wind River Range for the last four summers. He is a bit of a hummer, but he gets the job done! Londo also hails from a ranch in Wyoming. He is strong, tireless and very sensitive to the needs of his handler. Great with kids and adults alike. Jeremiah is also proving to be a great llama packer! It comes easy for him to develop a special bond with his handler. He is our tallest llama—nearly fifty inches at the withers. Elliot, a recent addition to our herd, was born on a llama ranch in northern California. He has just recently learned to love llama cookies and will do just about anything to get this treat. Click here to learn about a few of our llamas who have crossed the rainbow bridge. ELGIBILITY: Participants should be in sound health both physically and mentally. All health issues must be disclosed before each trek. Ordinarily, we cover 2-7 miles at a moderate to leisurely pace per day. We can design trips from easy to strenuous depending on the hikers ability. CHILDREN: Children age 6 and older are welcome on our treks in the company of a parent or guardian who assumes complete responsibility for the child’s whereabouts and safe conduct at all times. Children must be able to walk the distance of the day’s hike since the llamas cannot be ridden. RESERVATIONS: Reservations should be made as early as possible. For a 2 or 3 day trek, a $100 deposit per person is required to confirm the reservation. Balance is due 30 days prior to scheduled start of the trek. For a day trek, payment is due in full 14 days prior to the trek date. We do not accept credit cards at this time. CANCELLATIONS: If you must cancel your reservation, please notify us as soon as possible. If you cancel 60 days prior to your scheduled start date, 50 % of your deposit will be refunded. If cancellation is received 30 days or less prior to start of your trek, your entire deposit is forfeited. However you will be given the opportunity to reschedule your trip at a mutually agreeable later date and use the deposit to apply toward that trip less a $50 handling fee. CONTACT PERSON: One member of each group should be in charge of handling all arrangements (applies to group reservations only). TRANSPORTATION: We will meet at the trailhead or a specified meeting place. We will notify you of the exact location and time to meet. Your automobile may be left at the trailhead, but San Juan Mountains Llama Treks assumes no responsibility for automobiles left unattended. Please leave your valuables at home. 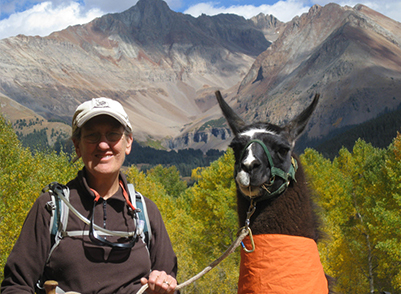 SAFETY: San Juan Mountains Llama Treks values the safety of guests above all else. We have chosen our trails and equipment carefully. Our guides are veteran hikers/llama trekkers, trained in first aid and CPR. In the unlikely event of an accident or illness, they will aid the ill or injured person until medical help arrives or evacuation is executed. Any cost of evacuation (helicopter, etc.) and of any medical care beyond first aid is the financial responsibility of the ill or injured person. We advise each hiker to review their medical insurance coverage before taking part in a trek. Remember SAFETY is top priority! 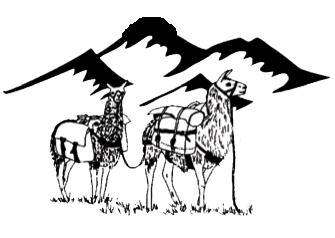 INSURANCE: San Juan Mountains Llama Treks' liability coverage requires all participants in a trek to sign a release form pertaining to the assumption of risk. Each perspective hiker must read and sign the statement, assuming such risks. Parents will be required to sign along with children under the age of 18. UNDER COLORADO LAW, A LLAMA PROFESSIONAL IS NOT LIABLE FOR AN INJURY TO OR THE DEATH OF A PARTICIPANT IN LLAMA ACTIVITIES RESULTING FROM THE INHERENT RISKS OF LLAMA ACTIVITIES. PURSUANT TO SECTION 13-21- 119 COLORADO REVISED STATUES. CANCELLATION BY SAN JUAN MOUNTAINS LLAMA TREKS: For the welfare and safety of all members of our trekkers, we reserve the right to cancel or change a trip at anytime as trail or weather conditions dictate, or due to lack of participants. If we are forced to cancel and you are unable to reschedule, your money will be fully refunded.